In 1993, Allegro Vacation Club began selling timeshare products with a view to providing their members with innovative products that could fulfil the needs of even the most discerning holidaymaker. 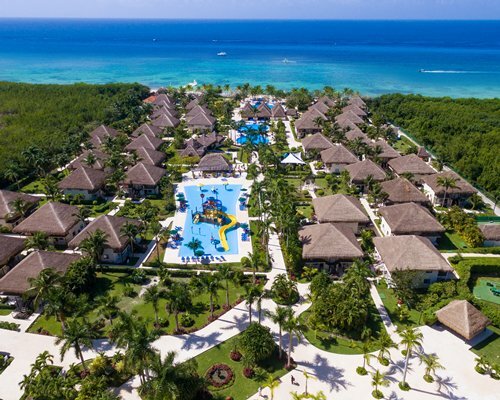 Following their rebrand to become Occidental Vacation Club, along with their acquisition by Barcelo Hotels and Resorts, the Club has gone from strength to strength. In their nearly twenty-five years of existence within the leisure industry, their constant growth has been a mile-marker for the excellence they provide. A stunning portfolio of unforgettable holidays in sought-after locations has resulted in a community of over thirty thousand members – and that many people can’t be wrong! This full-scale all-inclusive resort company ensures that members can choose from a list of properties and destinations that only provide the very best. Occidental Vacation Club’s high service levels and top notch amenities include properties which offer a fully stocked in-room bar, members’ lounge, multiple restaurants from which to choose, along with beach areas reserved for exclusive use of the resort’s guests and owners. Occidental Vacation Club’s flexible ownership program further bolsters the company’s commitment to providing as much bang for your buck as possible. Your ownership will in some cases allow multiple uses throughout the course of the year, your choice of check-in day, and many fantastic locations in Mexico, the Dominican Republic, Costa Rica, and the Caribbean. Further flexibility comes in the form of affiliated hotels around the world, offered in association with Diamond Resorts and timeshare exchange companies RCI and ICE. Timeshare with Occidental Vacation Club could see you enjoying holidays for a lifetime frozen at today’s prices. Benefits common to all tiers of ownership within the club include: discounted all-inclusive rates; private and early check-in and late check-out (subject to availability); extra holidays with Bonus Time, and personalised holiday planning tailored by the Club’s own dedicated team of agents. Travel and Leisure Group timeshare brokers love the wide range of options offered by Occidental Vacation Club, and we think you will, too. With the way you work and drive yourself to succeed, you know you deserve way more than any old timeshare getaway. After putting in all the effort, participating in the rat race day in and day out, it is payback time. And since you are your most important client, nothing less than a points-based vacation club membership at Occidental Vacation Club Points will suffice. This is the perfect gift. Travel and Leisure Group timeshare brokers believe an all-inclusive holiday is just what you need: nothing on your mind except relaxation and having a good time. It is really not difficult considering you have access to a full scale all-inclusive resort company with four- and five-star properties in the Caribbean, Mexico, and Costa Rica. Each resort has multiple fine dining restaurants, swimming pools, exclusive beach areas, and a whole range of entertainment and leisure activities that create a sumptuous and luxurious experience. Here, you are the celebrated guest receiving personal attention, exclusive amenities, preferred accommodation, and personalised vacation planning and discounts. The program is very flexible and can be passed along, too. More important, Occidental Vacation Club Points ensures a lifetime of travel benefits at the best prices that you have earned. What could be stopping you? Enquire today. For more information about timeshare for sale at Occidental Vacation Club click here. They say you cannot have it all, but those saying that probably lack a timeshare ownership at Occidental Grand Xcaret in Playa del Carmen, Mexico. At this stunning resort, guests are treated to an array of experiences that awaken every fibre of their being: from the hypnotising coast, ancient caves and underwater gardens, and tropical flora and fauna, to winding river channels, and ancient Mayan villages. Travel and Leisure Group timeshare brokers find that this all-inclusive resort has everything it takes to give you memories to last a lifetime. The resort is within an ecological and historical preserve so eco-touring to the adjacent Xcaret Park is a big draw. But excellent in-house facilities also keep guests busy. This includes eleven restaurants, nine bars, a disco, five swimming pools and ten hot tubs, beach club, Kids' Club, and organised sports activities for all ages. With all these opportunities, there is no way you will come out of here with less than extraordinary stories. Finally, the apartments at Occidental Grand Xcaret are equally special. Each is surrounded by natural beauty and every inch is simply paradise transformed into a comfortable abode. Amenities common to all accommodations are air conditioning, stocked mini bar, cable TV, and private bathroom with shower, tub, and hair dryer. For more information about timeshare for sale at Occidental Grand Xcaret click here. Occidental Allegro Cozumel is a breath of fresh air from the usual cheesy cruise ship destinations in Quintana Roo, Mexico. Here, timeshare owners revel in a tropical island with all the trimmings, but with a delightful air of authenticity. Accommodations are spread over more than three hundred bungalows embraced by gardens with views of the Mexican Caribbean Sea or the four swimming pools. Travel and Leisure Group timeshare brokers love the tropical decor of each, magnifying the island vibe created by the white sandy beaches, picturesque rocky coasts, lush mangroves, and jungles everywhere. Amenities common to these family-friendly rooms are king or double beds, air conditioning and ceiling fans, cable TV, coffee maker, iron and ironing board, safe, and bathroom with tub, shower, and hairdryer, and patio. Cribs and extra beds are available on request. Diving and snorkelling are the main draws of Occidental Allegro Cozumel but there is plenty more to do within this all inclusive resort. Guests enjoy unlimited food and beverages and access to the five restaurants and bars, gym, spa with whirlpool tub, Kids Club and Pirates themed water park, and Ultimate Dive Experience with four daily dives, plus amenities, treats, and discounts specifically designed to indulge dive enthusiasts. For more information about timeshare for sale at Occidental Allegro Cozumel click here.